I tried the Millstone 100 expression today. Stunning. A bit sweet on entry and then SPICE. 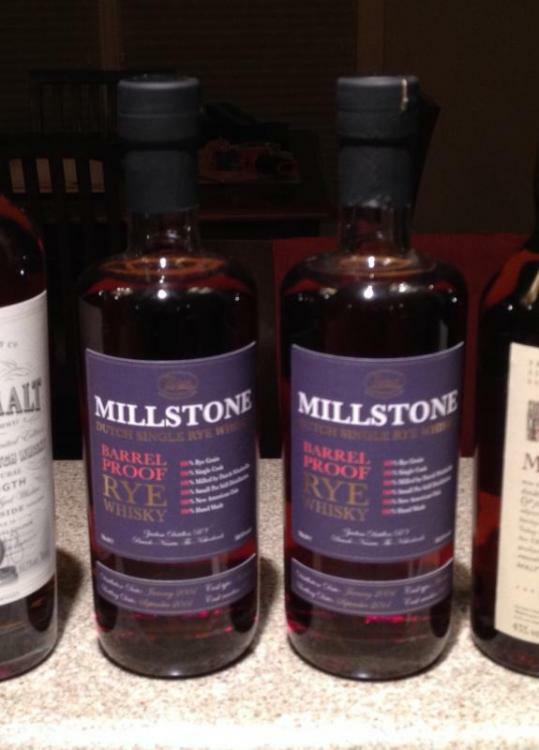 Everything you know and love about rye squeezed into a single bottle. Indeed, marvelous stuff. And if you think that is good imagine the same rye at 10 years old and barrel proof at 117.2 proof! A single barrel exclusive bottling from The Whisky Exchange. Unfortunately very spendy, especially when you add the expensive shipping to the US and I don't know if they have any left but it was everything the Millstone 100 was and a whole lot more! I didn't pick up a bottle when I had a chance yesterday and regret it. Will correct this misstep over the weekend. I think it was one of the best rye whiskies I've ever tasted. Just picked up my first bottle of Pikesville. Not at $11. $16 instead, but I am not complaining. Quite nice! I will not claim to be a connoisseur, but this hits the spot. I will advise that my usual preferences run to Bourbons with high rye content rather than that which is normally classed as rye. Not having to do with much of anything I'm having a glass of Whistlepig at the moment. This is following a bowl of fresh pineapple. Goes remarkably well. Did your bottle look like the one in this blog post? As you probably saw it is a young 3yo 80 proof rye (although I agree with the blog that for the price it was pretty decent). As Heaven Hill makes only one rye mashbill this is a younger lower proof version of Rittenhouse Rye BIB. But Heaven Hill is about to make a big change in Pikesville Rye! It will soon become a swanky looking 6 year old rye that is bottled at 110 proof. Basically the older higher proof version of Rittenhouse BIB. Pretty much perfect for cocktails! Don't suppose anyone has any suggestions for a replacement? I am told from fairly reliable sources that a final decision on the fate of the original 3yo Pikesville rye has not been made yet by HH. I would be a little surprised if it hangs around but these days who knows? But if you like it I might think about stocking up if you can! If you are looking for a young inexpensive rye as a replacement you might try Old Overholt. Also now a three year old rye, this one is from Beam. But they aren't exactly the same in taste. Maybe the 2yo Willett would suit you as well but it is typically more expensive at around $35 last time I looked. And I really think the quality of the new, younger Overholt isn't near as good as the previous, older iteration of Overholt (4 year). I agree with that as well. Just doesn't seem to deal with its youth as well as the Pikesville Rye does. Or rather did? Anyone try this stuff on the right? Can't say I have...it's only 90 proof. The reviews I've read have not been positive. I suppose it can always go into some weird punch. One of the many labels coming out of Terressentia in SC (although they recently bought the old Charles Medley distillery in Owensboro, KY which they renamed the O.Z. Taylor distillery). This is a company that buys whiskey (likely much of it young whiskey from MGP but who knows for sure?) and "treats" it with an ultrasonic process which it claims makes it taste like more mature whiskey. My few early dalliances with their brands suggest that it is not the least bit successful and still tastes like young raw whiskey. I have not had this particular version and I don't plan to do so. Still unopened - have I got a deal for you...! I'm enjoying a bottle (not all at once) of Whistlepig single barrel, barrel strength, 115.9 proof, 10 years. Does not taste like marshmallows. I'm not very good with tasting notes, but beyond an initial heat it leaves a most satisfying and complex flavor in the mouth. Some people say they taste pepper in good rye but I can't say I do. Something initially sharp and grassy, in a good way, but not pepper. Followed by a faint hit of vanilla and something more. Someone with a good gas chromatograph could check for pepper but that's not a piece of kitchen equipment that I have. And I seriously doubt they'd find it. Well, I would have access to a GC (actually to quite some machines) and one of the largest compound spectra databases. Care to send me a bottle ? "Almost all of the world's ingredients can be found in eastern Guangdong, but the rest of the world does not necessarily have all of eastern Guangdong's ingredients." Most amusingly I woke up dreaming about chromatography. I was criticized for overloading a sample and the whole thing was taking far too long. When the alarm went off I was reading the table of contents of an old textbook for a solution to the problem after searching though shelves and shelves of library. I'd think you'd be looking for rotundone, by the way. *If 1687 is considered ancient. I find many ryes to be "earthy" (my personal and rather nebulous term for the flavor I find in a lot of older ryes) rather than peppery while some (MGP for instance) tend to run towards a dill pickle/herbal range, especially relatively young. That Canadian groundhog from Vermont is of course generally older and has lots of that lovely earthy and yes, grassy at times, character to me. Pepper, not so much! The Times today reports on a blind tasting panel -- including our beloved @Splificator -- Knob Creek came out on top. Me, I can't believe spending $2400 on a rye. For that one could get a nice bottle of rum or perchance a lovely wine. Enjoying barrel strength Whistlepig at the moment. Life could be far worse. Reminiscent of my last bottle of Whistlepig, part way through the flavors really opened up. It smells like butterscotch and tastes like mint. 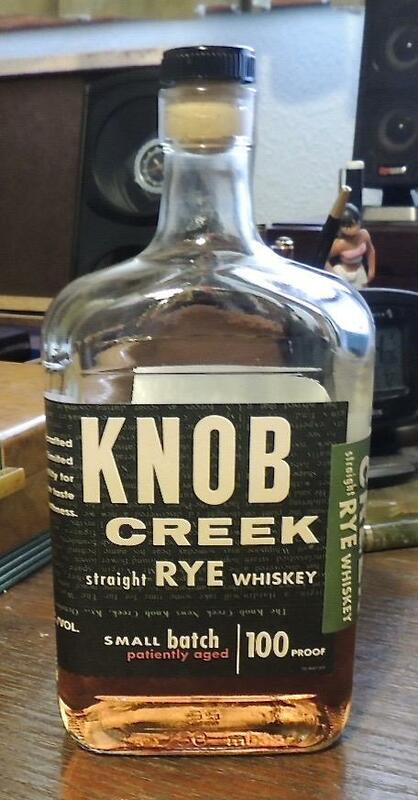 I am a fan of Knob Creek. Since you mentioned the price, I will add that the prices quoted for the bottles I'm most familiar with struck be as being on the high side. I'm curious what others think. I compared them with my local Total Wine store and to Hi-Time, where I place the occasional order. Below is the top 10 listing from that NYT article. The first price is the one quoted in the article, followed by the prices at my local Total Wine (TW) and on Hi-Time's (HT) website as of today. Some of the Hi-Times prices were marked as "sale" prices. The (rī)1 was the outlier, being significantly more expensive at my local outlets. Since it wasn't clear, according to the Times article, $2400 was for 13 year old Pappy van Winkle's. Me, I must make do with Whistlepig.